Taking today to enjoy Update Friday, the day where I pick a post from the archives, back in the day before I showed loads of scans and such, and make it all shiny and new with scans and additional commentary. 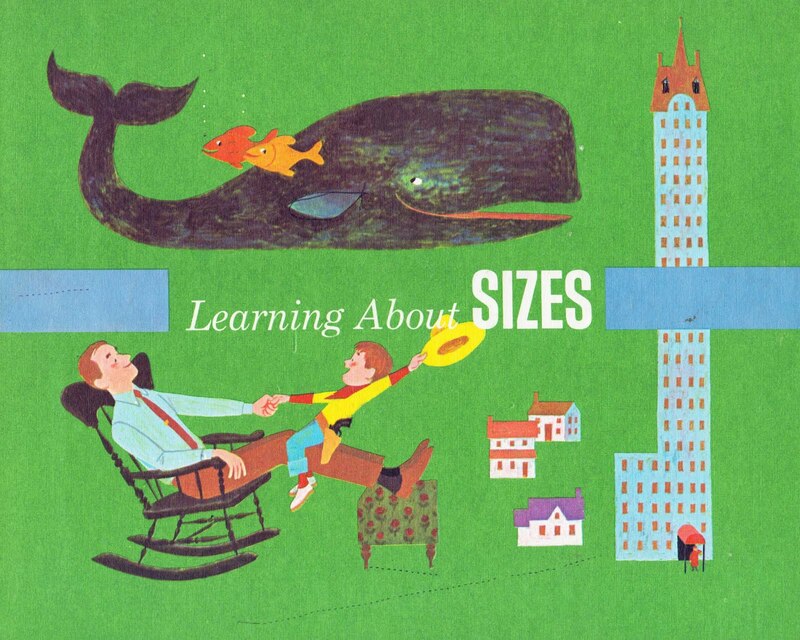 Please welcome, Learning About Sizes. This book looks beautiful! Vintage childrens books are my favorite and I just love your website! I was wondering if I could ask you a question about a childrens book I am looking for. It is one I remember from my childhood, in the early 80s. It was a picture book about animal houses. But in it a bear didn't live in a cave, and a beaver didn't live in a dam. The animals lived in beautiful houses with many rooms, some with sun rooms, some camouflaged into their environment, each house specifically tailored to fit the needs of the animal. The illustrations were beautiful. Have you ever come across a book like this?? It sounds familiar but I can't put my finger on it. Have you tried whatsthatbook.com? the folks on that forum are amazing and with a vague description, they can usually come up with a name super quick! Good luck!